Stephanie Summa is a physician assistant who is serving as a volunteer in Mwandi, Zambia. In this piece, she demonstrates the ripple effect in action in Mwandi. Before even arriving in Zambia, I attended the CMMB volunteer orientation The first slide we all looked at had Mother Teresa’s quote about the ripple effect. These quotes are always inspiring, and you hope that your actions could spark a positive chain, but I always had trouble finding true examples. Luckily my time in Zambia is helping fix that! I arrived in Zambia in October 2017, shortly after the first CMMB Medical Mission Trip to Mwandi Mission Hospital. Although I didn’t get the chance to meet the participants, I was able to observe how the experience had impacted them. 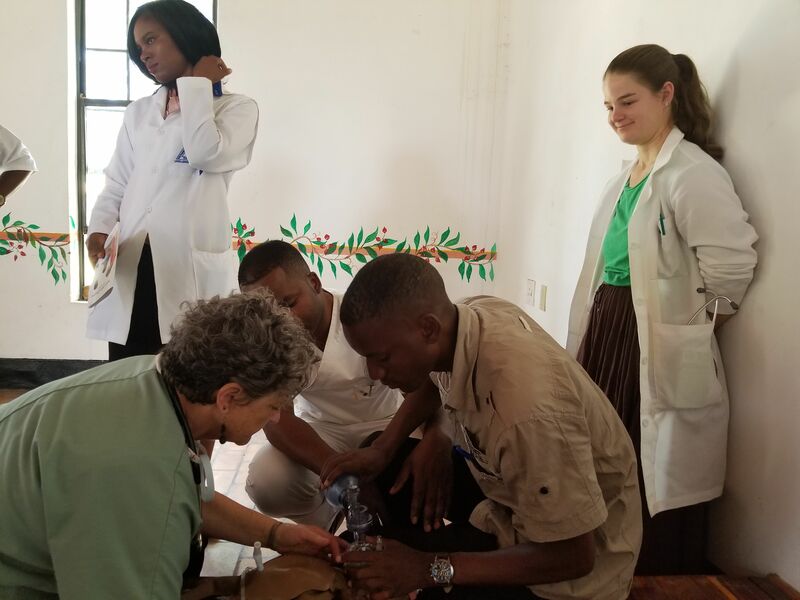 Dr. Danielle Beidleman and the other participants were surprised by the lack of equipment and resources at the rural health facilities. These facilities are – for many people – their only access point to medical care and yet some have broken thermometers, no blood pressure cuffs, no running water, and/or light source. These gaps stuck with the mission team, and as I transported a backpack full of a blood pressure cuffs, rechargeable batteries, and other medical goodies collected and sent by Dr. Danielle after her trip, it got me thinking what else did these facilities need that would be easy to obtain? Thus, the ripple began and what followed was a simple equipment survey of the rural health facilities with the help of the Mwandi team. The questions were pretty simple. What equipment do you have? What are you missing that can help you with your work? What are your strengths? What are your weaknesses? One of the largest gaps that stuck out to me was the lack of neonatal resuscitative equipment. The first 28 days of life is a period associated with high mortality, with 41 percent of deaths in children under-5 occurring in this timeframe. One of the top three causes of neonatal death is asphyxia, or oxygen deprivation at birth. This is also one of the most reversible conditions, with the proper training and equipment. When a baby is born not breathing, one must attempt to stimulate the breathing reflex by drying the infant. If this doesn’t work, you suction the mouth and nose with a small sucker, and if that fails, then you start ventilation with a bag and valve mask. Very often these interventions are successful and within a minute, a baby who is born blue and still can become pink and vocal! The first 28 days of life is a period associated with high mortality, with 41 percent of deaths in children under-5 occurring in this timeframe. Noting this gap, a proposal was submitted to CMMB Zambia for a plan to obtain resuscitative equipment and to train the in-charge nurses at all rural health facilities in neonatal resuscitation. The proposal was quickly approved and it was then time to find the equipment. Meanwhile the second mission trip was being organized and was coming soon. 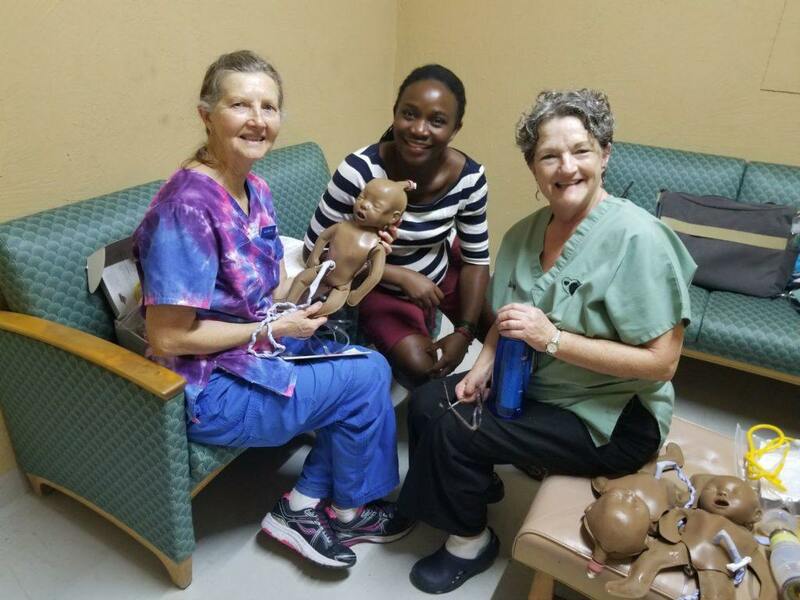 On the list of participants was Mary Piowaty, a Respiratory Therapist who had worked many years with deliveries and Ali Burt a labor and delivery nurse. Team preparing for neonatal resuscitation training session with neonatal Natalie dolls. Alli Burt (left), Midwife Likondo (middle), Mary Piowaty (right). Here were the people who had the skills and experience of neonatal resuscitation being delivered right to my doorstep and they were willing to facilitate a training. All that was missing was the equipment. But that ripple kept rippling. When I sent the survey of needs for the rural health facility and noted the need for resuscitative equipment the entire group sprang into action. 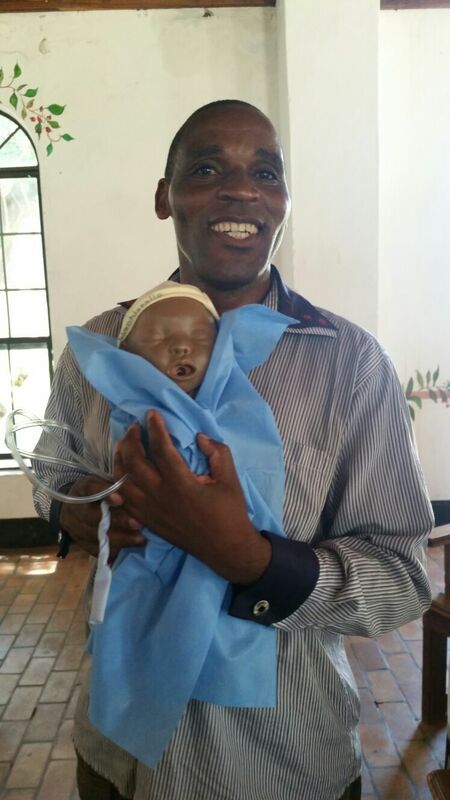 On March 7th and 15th the Neonatal Resuscitation Program was offered at Mwandi Mission Hospital. The eight in-charge nurses, representing each of the eight rural health facilities, and numerous other nurses and midwives were in attendance. The session began with a lecture in neonatal resuscitation, followed by an opportunity to put their new knowledge into action. Using the NeoNatal Natalie – an inflatable simulator infant. One of the participants with a NeoNatal Natalie infant. 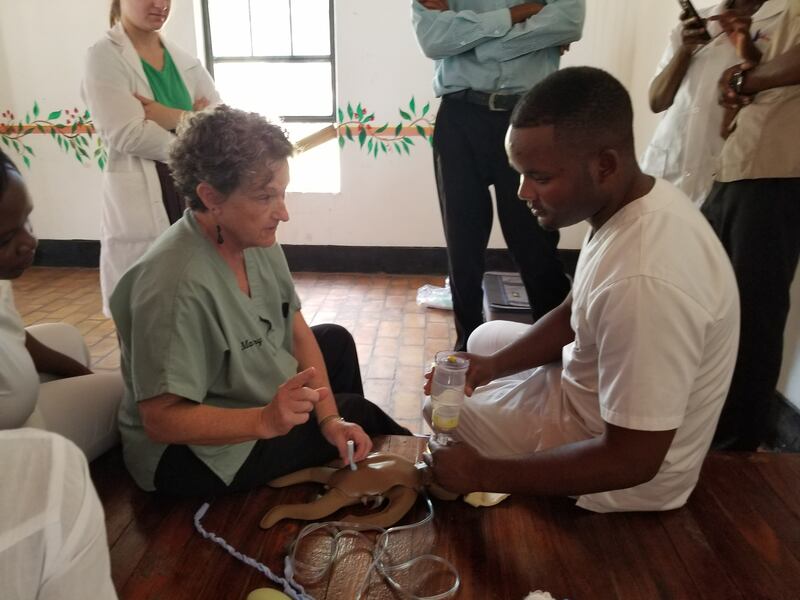 As I watched those little infant NeoNatal Natalie chests rise as the participants practiced their new ventilation skills my own happiness was reflected on the face of one of the Mwandi Midwives, Likando, who had helped teach the session. She was beaming as she watched. The in-charge nurses were excited as well, and this was most evident at the end when bags of equipment were distributed. These bags not only held the suckers and bag/valve masks needed for resuscitation, but also held blood pressure cuffs, headlamps and flashlights, and stethoscopes – all needs that they had identified on the survey. And as if that weren’t enough good news, within the next week we were getting positive reports. 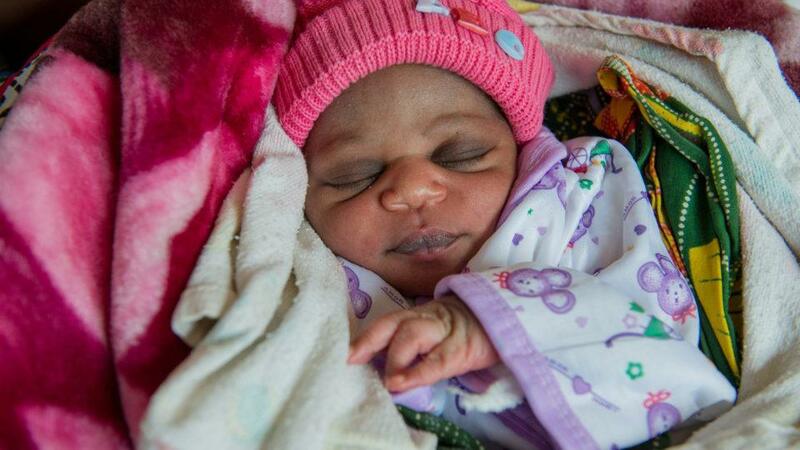 A baby in Mushakula was born still and not breathing, but Patrick – the in-charge nurse at the facility -using his new skills and equipment was able to revive the baby! In fact, we heard of two successfully resuscitated babies at two separate facilities within one week. What a ripple! Some might even call it a wave. More often than not, it’s difficult to track our ripples. But you can never know what just one simple observation and action can lead too. By supporting a volunteer, encouraging a friend, or just sharing a smile, you too can cast a stone in the water. At times the challenges we face can seem daunting and impossible to fix. But when we remember that we are not a world full of problems, but rather a world full of a majority who want to be a part of the solution, than just one small step can be the stone to wider effect.